Texas' Largest Handicap Van and Mobility Dealer. ADA was created out of a necessity from our family's life changing experience and need for mobility equipment and first class service. We have five locations to service the Greater Texas area. ASL is dedicated to designing and adapting devices that allow individuals with severe disabilities to achieve independent movement, environmental control and communication/computer access. Started by a father of a daughter with special needs, we build need specific hardwood or mesh SAFETY BEDS for disabled, medically fragile, & special needs individuals who need fall or entrapment & entanglement protection to ensure a safe sleeping environment. Using the finest materials, design & Amish craftsmanship, we are able to provide a SAFETY BED that is highly functional and medical need specific from our extensive clinical options & components. FULLY FDA COMPLIANT & FUNDED BY MEDICAID! Canine Companions for Independence® is a non-profit organization that enhances the lives of people with disabilities by providing highly trained assistance dogs and ongoing support to ensure quality partnerships. Debra Kerper has been specializing in Travel for Persons with Disabilities for the past 23 years. She has traveled the world using a wheelchair and/or a scooter. She is an amputee and has been living with lupus since the age of 20. Debra is considered an expert in the field of disabled travel and serves on Disability Advisory Boards for Virgin America Airlines and Royal Caribbean International. She has won three Trendsetter Awards from TravelAge West for her work with group travel. Firefly products celebrate the versatility of life by opening up opportunites for children and families to learn and grow together. Our posturally supportive and clinically excellent range helps to flood physical obstacles to involvement and participation with light and opportunity. 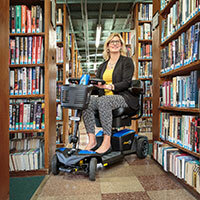 Great American Mobility specializes in Custom Rehabilitative Manual and Power Mobility Systems. We employ nationally certified professionals for all your custom mobility needs. As a team of experts with an exemplary track record in Greater Houston, our goal and commitment is to satisfy each client with superior products and excellent service. We strive to treat everyone like family with the proper courtesy they deserve. You can put your trust in us because Your Independence is Our Priority! Special needs families inspired our product line, designed to provide positioning and mobility support at home, school, and on the go. Our products give families the freedom to play, engage, and participate in daily life, from sunup to sundown. Designed to put a smile on your child's face, our products support each moment of the day, because ensuring your child receives the support he/she needs is our top priority. SIMPLE – STRAIGHT – STANDING The originator of standing wheelchairs over 40 years ago, LEVO continues on as the "Experts in Standing" worldwide! Boasting the most complete line of standing chairs, our product line includes: The manual/manual standing – LEVO LAE The manual/power standing – LEVO LCEV And, the power/power standing – LEVO C3 & COMBI Please visit our booth for a product demonstration and to learn of all the outstanding BENEFITS our best in class wheelchairs can offer you. GET VERTICAL! Prairie View Industries (PVI) has been a leading manufacturer of access products for 25 years and are the creators of the original "multi-fold" ramp. Access products consist of a full line of portable ramps including thresholds, single-folds, multi-folds, utility, van (rear-door), solid and bariatric ramps. PVI also manufactures modular ramp systems that meet and exceed ADA guidelines. Our modular ramps are easily assembled to accommodate a variety of situations. Customs available. ProTouch Mobile Therapy provides therapeutic services in the comfort of your home, office or location of your choice. Services are provided in a safe and confidential manner in compliance with and above standard medical practice. Our practitioners are licensed, accredited medical professionals. The highly recommended SleepSafe® bed is available in three models, offering safety rail protection ranging from 8" to 36" above the mattress, depending on your model and foundation choice. SleepSafe® beds address the problems of entrapment and falls, and their full length safety rails can be quickly rotated out of the way to provide immediate access. Each bed comes with a premium gel infused memory foam mattress. Proudly made in the USA. Spinergy is the market's leading wheel manufacturer. Our lightweight, durable and high performance wheels have set the standard for 20 years. Our daily and sport wheels use a patented PBO fiber technology that is 1/3 the weight and 3x stronger than steel and 2x stronger than carbon/kevlar. Visit our booth to see all the customizations you can make to wheels with our web configurator. You can also check out our ZX-1 Power Add On. Launched in 1999, Stealth Products began in response to a need for versatile, high quality head and neck positioning systems as well as switch site location hardware. Stealth has expanded the product line to include, AP (All Positioning) Headrests, we also have our own seating, I2i's, Power tilts, Ultra QCR series, our TWB Hardware, also Pediatric Mobility Bases and Gatlin Mounts. Travis Medical is a Texas company that has been serving Texans since 1989. With 30 experience Assistive technology Professionals (ATPs) across the state, we are a top provider of rehab equipment for use in the home. United Spinal Association of Houston is a non-profit organization supporting Houston's diverse disability community. This includes individuals living with a disability, families/friends, healthcare and industry professionals, and other nonprofit partners. United Spinal Houston has 3 programs: (1) Project Hope, providing free medical supplies (2) Connections Peer Network, establishing peer and social support, and (3) Lazarus House Neuro, offering wellness services and life skills education.